Passenger pigeon extinction: Martha, the last passenger pigeon, died in 1914. Her name was Martha. She died 100 years ago. Martha at the Smithsonian Institution’s National Museum of Natural History, Washington, D.C. Adapted from A Feathered River Across the Sky: The Passenger Pigeon’s Flight to Extinction by Joel Greenberg, out now from Bloomsbury. By 1900 there were three captive flocks of breeding passenger pigeons. Martha, the last of her species, was the progeny of one flock, born in a second, and spent most of her life in the third. The entities that maintained them—an interested amateur, a distinguished academic, and the nation’s second-oldest zoo—were very different, of course, as were the reasons they acquired and kept the birds in the first place. If events had proceeded differently, it is possible Martha may not have been the last of her species. But “what if?” runs through this entire saga and can never be answered. 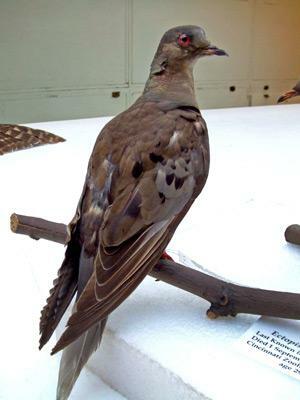 One of the captive passenger pigeon flocks was created and maintained through the efforts of David Whittaker. As a young man, he and his wife, Maria, searched for gold in California and then the Yukon. After more years prospecting in Ontario and the upper Midwest, they eventually settled in Milwaukee, on a bluff above the Milwaukee River. Wandering around the wilderness looking for minerals enabled him to develop and strengthen his fascination with nature. He evidently spent a lot of time looking up as well as toward the ground. Once he settled down, he sated this long-standing avian interest by raising birds and acquired a small aviary that housed passenger pigeons. The first occupants arrived in the fall of 1888, when Whittaker obtained two pairs of passenger pigeons captured in Shawano County, Wis., by a “young Indian.” One pair was of mature birds, while the other was of birds less than a year old. Unfortunately, the two older pigeons did not last long: “One … scalped itself by flying against the wire netting and died,” while the other escaped. Whittaker proved himself a patient and skilled aviculturist. After several fruitless years, his flock of two began to grow, eventually reaching 15. The slow, tedious process required close observation and care. Now the scene shifts a hundred miles south, to the University of Chicago and biologist Charles Otis Whitman. Born in Maine in 1842, Whitman seemed to lack interest in most everything as a young child, for one researcher says of him, “there is no hint from any of those I interviewed that young Whitman had any desire to play, draw, paint, climb mountains, travel, or build boat, engine, or carriage.” He was rescued at the age of 12 from a life of apathy by developing a strong interest in birds, a sure sign of exceptionalism. When his pet blue jay died, he stuffed it. While at Bowdoin College, all anyone recalled of him was that he devoted his spare time exclusively to the collecting of birds. Whitman received a doctorate from the University of Leipzig and taught at the Imperial University of Tokyo. He then spent some time at the Zoological Station in Naples, Italy, before returning to the United States. His research delved into such fields as animal behavior, embryology, evolution, and anatomy. One of Whitman’s true loves was pigeons. He amassed a large collection that eventually reached 550 live birds of about 30 species. These were housed in small cotes situated around his house in Hyde Park, a few blocks from the university. At least a few were always kept inside his home, serenading the human occupants with constant cooing. His goal was to study behavior, evolution, and genetics, and by working with such a wide variety of subjects he hoped to buttress his support of orthogenesis, a view that holds evolution to be “a directed and progressive process” determined by the characteristics of the species rather than the more random effects imposed by environment. This position had few adherents. From the high number of 16 passenger pigeons at the beginning of 1902, the flock began an irreversible downward spiral. The fate of Whitman’s collection might be seen as a microcosm of the entire species. Eggs were laid, a few hatched, but not one young bird survived. Over the same time, the adults began to disappear: Two escaped, two fell victim to tuberculosis, and others succumbed to causes unknown. One hen was given to the Cincinnati Zoo in 1902. Five years later tuberculosis claimed the last of Whitman’s birds, a pair of females. Although Whitman expressed his desire to have perpetuated the passenger pigeons under his care, conservation seemed of little interest to him. In this he was typical of the majority of academics and indeed his countrymen. Several more decades would have to transpire before a formal push began to enlist academicians in promoting the preservation of biodiversity. Whitman dutifully answered letters about his passenger pigeons and was generous in providing photographs of them for use in numerous publications, but he never published anything on their plight. Even worse, he failed to read the available literature that would have enlightened him that the pigeons did eat animal matter. When Whitman finally made the discovery on his own, he was sorry for not having furnished additional protein to his birds earlier, for they would probably have been healthier and produced more young. By 1907 Whitman’s flock was gone except for that one female he had sent to the Cincinnati Zoo. The Cincinnati Zoological Gardens, now formally named the Cincinnati Zoo & Botanical Gardens, commenced serving the public on Sept. 18, 1875, thus becoming the nation’s second-oldest zoo. Passenger pigeons were part of the zoo’s holdings from early on, and Martha, its last one, died on Sept. 1, 1914. That is known with certainty, but further details on the history of the species at the zoo are hopelessly confused. For any given account, there is apt to be at least one other that contradicts it. What follows, then, is my best attempt at telling the story. Others have told it differently. A year before the zoo opened, a patron gave two passenger pigeons to the zoological society. The zoo may have held 22 of the birds when it opened. Whether they were actually on display at the zoo opening is not known for sure, although it seems likely they were. The zoo then added three more pairs in 1877 at the cost of $7.50 for the lot. Soon the birds became amorous, and early in March of either 1878 or 1879, zoo director Frank Thompson observed his wards mating: “A single egg was soon laid in each nest and incubation commenced.” Despite temperatures as low as 14 degrees and the fall of so much snow that the nesting birds became completely covered, both the eggs hatched and young fledged. Thompson wrote in an 1881 article that the flock stood at 20 despite the death of one old-timer. Martha settled in. She fed, she rested, and she fluttered a bit. In her younger days, she might have tried her bill at nest building. It is possible she laid some infertile eggs. As the passing years took their toll, she watched the members of the flock slowly disappear. Stephans tried to augment the flock, but no pigeons were to be had. Due to Stephans, even details of her death are in dispute. Most accounts say she died on Sept. 1, 1914. Almost certainly, this was some time after the noon hour, most probably closer to 1, although it might have been four hours later. Keeper William Bruntz might have discovered her crumpled body, or perhaps the Stephanses kept her company as her life force reluctantly flickered to its conclusion, bringing closure to the feathered whirlwind that defied human understanding, if not the human capacity to destroy.